Specialized devices today are built with specific form factor, attached devices and various software environments. These systems are widely spread, often only tenuously attached and business critical. In the Retail space, with the traditional shops competing toe to toe against Online Business: efficiency in every part of the business is paramount to the bottom line. Anticipate failures, reduce downtimes, lower your maintenance costs - CHIPPC’s Xcalibur W enables you to meet these challenges by providing a unique Monitoring and Preventive Maintenance system for your specialized devices. Xcalibur W features a powerful and flexible monitoring engine - based on rules and triggers executed on client devices. Rules generate alerts that are sent to the Management Server whenever a specific event occurs on the client device. The system administrator is thereby automatically informed of any malfunctions on the remote equipment. When an alert is received by the server, an incident is logged into the system with details such as the date and time of the incident. Xcalibur W can execute Preventing Tasks when alerts are received, eliminating the need to perform manual interventions. 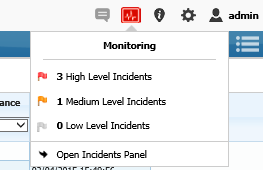 From the Device List view, administrators can see a counter of raised incidents. Monitoring rules are stored in the Monitoring Rules section. The system administrator must create rules first and then deploy them to target devices. Below are some scenarios provided as example purpose. Device Temperature - in case of overheat; the device can be automatically rebooted (with authorization from the user). The reason for overheat could be also compared with the Ram usage monitoring or services running monitoring. Free space on hard disk - By monitoring this, Xcalibur W can automatically run a clean disk application, remove the temp files etc… and inform the administrator that the disk in that device is running out of space. Further tasks can then be played. Hard disk predicted to fail (smart information) - By monitoring this information, the administrator can change a hard drive before it fails and hence prevent from losing precious data. Ram usage - By monitoring this, the administrator can detect a possible problem in the device, he can then monitor other services to determine which service is consuming Ram and hence optimize the efficiency of the device. Application or Service is down - By monitoring a specific service or application (such as a Kiosk Apps), the Xcalibur W agent can make sure that the application is running or not. For example, Xcalibur W will make sure that the webapp is running on a digital signage device that displays a video to the public. Check application freeze - By monitoring a specific application, Xcalibur W can make sure an application does not freeze. This is for example the case for a kiosk in a store that displays some specific information for customers. Xcalibur W will make sure that the application used to display that information is up and running and will relaunch it if the application is frozen. Anti-virus up-to-date - By monitoring the proper registry key, the Xcalibur W agent can determine if an antivirus is up-to-date or not. It is then possible to program an automatic task that the agent will run to update the antivirus from a specific web site. Firewall and Microsoft Security Center - By monitoring this component, you can make sure that the device is properly protected. If not, you are alerted on time to take action. Write filter status - By monitoring the write filter status, Xcalibur W can send an alert in case a write filter is not activated on Windows Embedded device.